As the owner of a crowded townhouse, filled to the brim with dogs and tenants, I can tell you first hand (and as an active allergy sufferer) that clean air means everything. Also, as said owner of both the home and dogs, it can become quite the time consuming and daunting task attempting to keep up with the daily hair, dust and every day airborne particulates. Well, let me rephrase that… it’s quite frankly impossible! It is in this one humbled young woman’s opinion that using every tool and piece of technology to help ease the pain of such arduous daily tasks is a necessity. I have found that rarely do the two seamlessly blend together in one user-friendly yet extremely effective solution; until now. 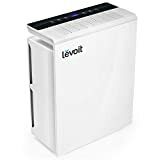 The Levoit LV-PUR131 with true HEPA air purifier is an incredibly well developed and designed air purifier that I found extremely easy to use and even more effective in functionality and, what surprised me, helping me realize I had a dog hair and construction dust problem. The LV-PUR131 is a true HEPA model that eliminates as much as 99.97% of all airborne dust, smoke pollen, molds, and dander, all the while not producing ozone as a by-product, unlike electronic-based air cleaners. HEPA air filters work by filtering airborne contaminants through a three stage filter that includes: a Fine Preliminary filter, True HEPA Filter, and an Activated Carbon filter. One of my favorite features was that it even neutralizes gaseous chemicals and odors beforehand -which again- living with multiple tenants cooking multiple types of meals comes in very, very handy. Even better when one of the settings you can choose to leave the air purifier running on is AUTO. Three filtration stages: Activated carbon filter, fine preliminary filter, true HEBA filter. These eliminate undesirable cooking, smoking, chemical, and other odors that may be invading your living areas. The Levoit provides air quality coverage for regular and larger rooms of up to 322 square feet, with a CADR rating of 135+. Easy-to-use LED controls and air-quality indicators: The interactive control display monitor features an auto switch that activates the unit’s automatic air-quality sensors. Color-coded lights indicate room air quality, the system will suggest fan speeds to handle existing conditions. The fan can then be set to low, medium, or high speeds according to your preferences and its very quiet. Quiet sleep mode: This setting directs the unit to operate at its slowest and quietest, for when you need your beauty rest or a more peaceful sleep from allergies. The built-in timer can be set to activate the unit from between one to a twelve hours later. 100% ozone-free operation: Neither UV nor ionizing processes are used that can generate traces of ozone, which can be hazardous in large volumes. Warranty: Includes a two-year warranty and lifetime support from the manufacturer. Easy to reorder filters ca be found on their website. Located on the top face of the Levoit is an awesome neat and very touch sensitive LCD display monitor. Here you can find all of the setting options you need to master the air of clean air, and, another surprisingly cool feature, you can monitor the room air quality in real time! Going back to the multicultural dining experience that goes on in my kitchen each evening for a moment – this is the perfect example to showcase the effectiveness of both the air purifier with its three step filtration process, and also the capabilities of the real time quality monitor. As we have an open floor plan from the kitchen to the living room, I found the best place to really put the purifier through its paces was smack dab in the middle of everything in he shared living spaces. So one typical evening, maybe our second or third night home with the Levoit, I come downstairs to the shared space, hearing the sounds of pots and pans but oddly not the usual mix of scents? I remember the air purifier had been running on auto and go check the real time air quality indicator light – which has now gone from the typical blue or green (very good, good clean quality) indicator light to an ominous red (BAD QUALITY! GET OUT OF THIS ROOM!) light due to the smoke and cooking smells. It was all working incredibly and I, for one, couldn’t smell a thing, and two, could clearly see that it was indicating bad air quality, and roughly ten or fifteen minutes after they were done eating and the smoke had dissipated, the light had gone back down to is calming green light. Not everyone may have the same hectic, airborne filled life-style as my crazy household, but everyone can benefit from clean, purified air quality – and the Levoit LV-PUR131 provides that and more.